Nous sommes heureux de vous faire part de la naissance de CyberLibris Famili. Après Cyberlibris Academia et Cyberlibris Executive, la famille Cyberlibris s'agrandit! 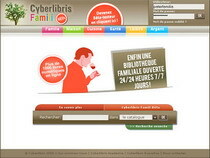 Cyberlibris Famili est la première bibliothèque numérique familiale. Notre rêve est simple: faire de votre ordinateur familial une vraie bibliothèque vous donnant accès en ligne en texte intégral aux ouvrages sous copyright publiés par les maisons d'édition francophones. Ces ouvrages couvrent les domaines suivants: Famille, Maison, Cuisine, Santé, Loisirs, Argent. Le catalogue de Cyberlibris Famili est riche de plus de 1000 livres. Pour l'instant, 700 environ sont en ligne. Cyberlibris Famili est à l'heure actuelle en phase de "bêta test". Cela signifie, comme nous l'annoncions dans une note précédente, que nous avons besoin de vous et de vos commentaires. Pour cela rien de plus simple: il vous suffit de vous enregistrer comme bêta-testeur sur Cyberlibris Famili. Nous serons heureux de recevoir tous vos commentaires. Ce site familial est aussi votre site et nous souhaitons le rendre le plus proche possible de vos sujets de prédilection. Nous vous réservons d'ailleurs quelques jolies surprises dont certaines nous ont été soufflées par les premiers aficionados de Cyberlibris Famili. Merci à eux. Merci à vous! Ad click fraud: Google is on the hook! And now one discovers that all this may be the base for significant fraud and advertisers being charged way too much by Google. I let you build your own opinion on this by having a look at the following documents Reportonthirdpartyclickfraudauditing1.pdf and Download tuzhilin_report1.pdf . Have also a look at John Battelle's account. I am not an expert on this issue but a little voice tells me that this story is far from being over even though Google has already agreed to reimburse $90 million to advertisers. For those who start learning statistics or need a refresher, here is a nice and complete on-line book available for free. "This Electronic Statistics Textbook offers training in the understanding and application of statistics. The material was developed at the StatSoft R&D department based on many years of teaching undergraduate and graduate statistics courses and covers a wide variety of applications, including laboratory research (biomedical, agricultural, etc. ), business statistics and forecasting, social science statistics and survey research, data mining, engineering and quality control applications, and many others. The Electronic Textbook begins with an overview of the relevant elementary (pivotal) concepts and continues with a more in depth exploration of specific areas of statistics, organized by "modules," accessible by buttons, representing classes of analytic techniques. A glossary of statistical terms and a list of references for further study are included." PS: A print version is available here. Seth Godin has a good post for wannabe authors. A few good rules not to be disappointed. Let me add this reminder from a previous post and look before you leap! And, by the way, if you are about to write a book and have written one or many, please do consider us ! We love books. We love it even more when they reach their audience! "In 2004, The American Finance Association Board approved a project to record aspects of the History of Finance. Stephen Buser was appointed Historian with the mission to produce video interviews with important contributors to financial economic knowledge. Links to streaming videos of edited versions of interviews with Harry Markowitz, William Sharpe, Paul Samuelson and Robert Merton are posted below. Transcripts of the full texts of these interviews will be available in due course. Additional interviews with other seminal scholars in the field are planned." I hope the AFA will soon provide RSS feeds so that we can subscribe to its numerous resources. I hope also that AFA will give more and more emphasis to history. Indeed, my view is that finance scholars ought to study history more: They'll learn a lot about all the (financial) things people knew how to do in the past!